Signup to your account MakeMyTrip account . After login, you will be awarded as Rs.500 free sign up bonus. 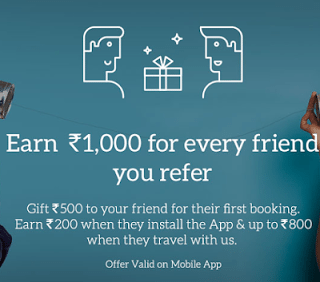 Refer your friends & Earn upto Rs.10000 (With a cap of Rs.2500 per day). Per referral you will get Rs.1000 wallet money (Rs.200 for download & sign up + Rs.800 after first booking).